Description: A westbound loaded grain train rolls under the bridge at Gerlach. Description: Empty stacked truck trailers used for carrying containers is something not seen before on 214. Description: Sitting just south of the UP North Dexter Crew Change Point waiting on a new crew was BNSF Train H PTRGAL9 01 operating over the Chester Sub. via Trackage Rights. It operated as UP Train QPTG4J 01. Title: BNSF 4667, BNSF's Aurora Sub. Description: NS Eastbound Vehicle Train 270 ( Birmingham, Al. to Lincoln, Al. Honda Plant ) passing through Control Point Henry Ellen near Leeds, Al. Description: 3:06 An eastbound grain train lead by 2 BNSF Dash 9s blasts its K3 horn. 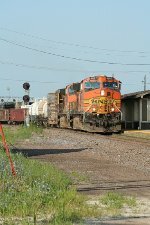 Title: BNSF 4667 heads west with a mixed freight.